Lincoln and Lee Taiz wrote the libretto for the Star Trek-based opera. Contributed photo. 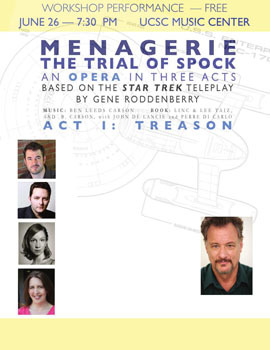 The official flyer for the Star Trek-based opera features a photograph (to the right) of director John De Lancie, who played the villainous and powerful Q, antagonist of Captain Jean-Luc Picard (Patrick Stewart) in Star Trek: The Next Generation. Some sci-fi buffs think of Star Trek, Gene Roddenberry’s wildly successful television and movie series, as a "space opera”—in other words, a broad, splashy melodrama that takes place in other galaxies. But Captain Kirk and Mister Spock have never had a chance to sing their lungs out in an actual Star Trek opera—until now, that is. Thanks to the creativity of a diverse group of professors, staff members, and their associates, Star Trek has been turned into a real opera. And if you’re curious to see what happens when you mix Vulcans, tenors, warp speed, phasers, and mezzo sopranos, here is your chance: A free “workshop performance” of the first act of the opera, with an orchestra and electronic back-up, takes place June 26 at 7:30 at the UC Santa Cruz Music Center Recital Hall. It’s a rare opportunity to experience an opera under construction. This workshop performance, which presents the first act of the opera, is a way to try out and gather feedback as the creators work to shape it into its final form. Star Trek superfans should be pleased to know that the opera’s director is John De Lancie, who played the villainous and powerful Q, antagonist of Captain Jean-Luc Picard (Patrick Stewart) in Star Trek: The Next Generation. And though Menagerie: The Trial of Spock is a full-fledged opera, the running time, for this one-time-only performance of the first act is just 45 minutes. It is a special-effects-free dress rehearsal, so transporters, prosthetic pointy ears, and devastating phaser blasts will not be a part of this production. This opera has deep roots that go all the way back to the tumultuous 1960s, when one of the project’s creators—renowned plant biologist and science writer Lincoln Taiz, now an emeritus professor at UC Santa Cruz—became a lifelong Trekkie. Taiz wrote the libretto for the opera along with his wife, Lee. 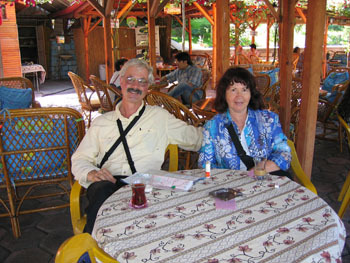 Early in the writing process, David Cope, a long-time friend of Taiz in the UC Santa Cruz Music Department, suggested fellow UC Santa Cruz professor of music Ben Carson, as a possible composer for the “Star Trek” opera. Carson liked the idea, and soon he and Taiz joined forces and became fast friends. They also had some help from Perre de Carlo, who is involved in the film industry. Taiz takes his Star Trek obsession seriously, but he has a droll wit and a wistful quality that came into play when he looked back on his first exposure to the TV series. Though Taiz has devoted much of his life to the sciences, the arts run in his bloodstream. Originally from Philadelphia, his mother, Malvena Taiz, was a modern dancer who studied with Martha Graham. She was a friend of John de Lancie Sr., the principal oboist with the Philadelphia Orchestra and father of the actor John De Lancie Jr. In fact, De Lancie was the one who first suggested staging a workshop version of the space opera and using audience feedback to help shape the opera into final form, a common practice among directors of stage plays. “To our infinite delight, he offered to come to Santa Cruz and help us pull it off,” Taiz said. While the creative talent and the will to produce a Star Trek–based opera was in place, the opera team faced a variety of obstacles in their path to the debut performance. “Even before the writing began, the first major hurdle was to get permission to proceed with the project from the owner of the copyright, CBS,” Taiz said. “This was somewhat nerve-wracking, but in the end we got what we (wanted). CBS signed off on the condition that the opera adaptation was not a money-making venture." If the creators ever monetize this production, they would need to check in with CBS once more and work out some sort of arrangement. But so far that has not happened, and the opera-makers are free to proceed. What’s next for the space opera? The first step is to bring the opera to the attention of various opera companies through personal contacts, both in the U.S. and abroad, and through a video that will be shot of the June 26 performance and made available online. After that, who knows? For now, composer Ben Carson and his cohorts are squarely in the captain’s seat at this point, exploring a strange new mash-up of sci-fi and opera, ready to beam it out to the world.